Karnataka Assembly floor test LIVE updates: Following reports that BS Yeddyurappa might resign if he does not have enough numbers to prove majority, Congerss' DK Shivakumar exuded confidence that his party will soon come to power. "I am sure he will resign before the trust vote," he said. Meanwhile, the Congress has released another audio tape, this time alleging that BS Yeddyurappa offered ministerial post to MLA BC Patil. Congress leader Veerapa Moily said that BJP will be "exposed" to the whole world. "They (BJP) know very well that they a re 104. Still they are trying everything and anything to buy our MLAs. But, our MLAs are intact. The Supreme Court, earlier on Saturday, turned down Congress and JD(S)' plea against the appointment of KG Bopaiah as the pro tem Speaker KG Bopaiah. However, it allowed the live telecast of the trust vote. A bench of Justice AK Sikri, Justice SA Bobde and Justice Ashok Bhushan on Friday said the pro tem Speaker, conventionally the senior-most member of the Assembly, would administer the newly -elected members their oath and then conduct the floor test. The court also restrained the chief minister from nominating an Anglo-Indian member. 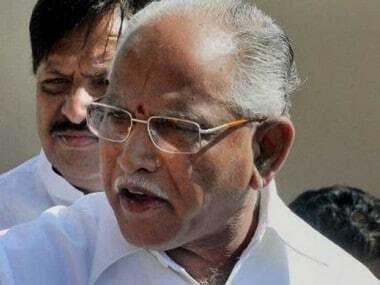 Following the apex court order, Yeddyurappa told reporters in Bengaluru that he was confident of proving his majority in the House. "We welcome the Supreme Court order of floor test at 4 pm on Saturday. We are confident of proving our majority," he said. Union Human Resource Development Minister Prakash Javadekar, who was election in-charge of the BJP in Karnataka, also expressed similar confidence. On the other hand, Congress president Rahul Gandhi said the BJP's "bluff" has been called. "The BJP's bluff that it will form the government, even without the numbers, has been called by the court. Stopped legally, they will now try money and muscle, to steal the mandate," he tweeted. Congress communications in-charge Randeep Singh Surjewala told reporters in Delhi that th ey will bring the matter of Bopaiah's appointment before the court. In Bengaluru, Congress leader Ghulam Nabi Azad said it is surprising that the Congress and the JD(S), which together have the support of 117 legislators including two Independents, were not invited to form a government by th e governor.